Build a big adventure of your own with a new remote control (RC) crane with grabbing function. Built for moving heavy cargo from one location to the other and measures about 2 1/2 feet high. Full function remote control allows the crane to move up, down, and also turns 720 degrees around. 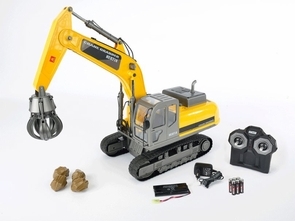 This RC crane makes the ultimate addition to any of our remote control construction toys. Yes, you control the pulley with the remote control as well. Turn the machine on the spot, lower and raise the grabber arm. Now you can have your very own grabbing games at home and supply your own surprises. Buy more than one and we will send separate operating frequencies for the remote controls. Still want more? Buy right now and you will receive a rechargeable battery pack and charger with each RC crane. I love the crane it is fantastic and my son plays construction every day. This huge R/C forklift measures in at 3 feet long and is a high quality construction vehicle that is worth the price.